Jiang, X., Zhao, T., Shi, Y., Wang, J., Li, J., and Yang, H. (2017). "H2SO4 and NaOH pretreatment to enhance bio-oil yield of pine wood liquefaction in methanol," BioRes. 12(2), 3801-3815. Pine wood was pretreated with H2SO4 and NaOH, followed by liquefaction in methanol at temperatures ranging from 200 to 350 °C, to produce bio-oil. 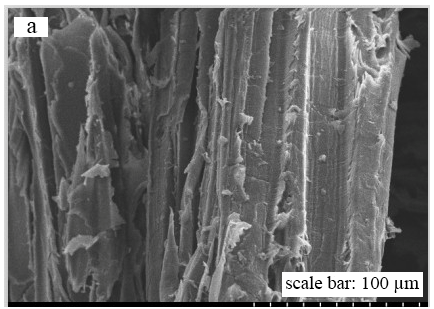 Composition analysis and scanning electron microscopy (SEM) observation were performed to study the impact of the pretreatment on the pine wood structure. The SEM images showed that the structures of the samples were destroyed by pretreatment. After being pretreated by H2SO4, the size of holes generated was smaller than that with pretreatment by NaOH. Furthermore, the influences of the temperature, methanol content, and residence time on the yield of the water-soluble fraction (WS), ether-soluble fraction (ES), and bio-oil were determined. Shorter residence time and higher amounts of methanol favored the products of WS, ES, and bio-oil. Gas chromatography-mass spectrometry (GC-MS) analysis showed that phenols, ketones, aromatics, and aldehydes are the main components of bio-oil. Researchers around the world have recently shifted focus to renewable resources because of energy shortages and environmental pollution (Guo et al. 2010). Biomass is a potentially renewable and environmentally friendly resource (Akhtar and Amin 2011). The most common biomass conversion technologies for obtaining liquid fuels are thermo-chemical and bio-chemical processes including pyrolysis (Sun et al. 2010), thermal liquefaction with various solvents (Zhang and Zhang 2014), gasification (Jana and De 2014), and fermentation (Cheung et al. 2015). Thermal liquefaction is one of the more promising methods for converting biomass into liquid fuels in the presence of organic solvents (Huang et al. 2014) or water (Tymchyshyn and Xu 2010). The raw materials are not required to be dry before the chemical conversion, while pretreatment is imperative in the processes of pyrolysis and gasification. Biomass primarily contains three components: cellulose, hemicellulose, and lignin, which can affect the production, distribution, and the yield of bio-oil during the thermal liquefaction process in different ways (Harun and Danquah 2011). Cellulose and hemicelluloses are tightly connected to lignin by hard-to-break hydrogen bonding. The recalcitrant nature of biomass can lead to a low yield of bio-oil, limiting high-volume applications (Sun et al. 2004). Therefore, pretreatment is essential to break down the hydrogen bonds and the crystalline structure of biomass (Bals et al. 2011; Redding et al. 2011). Various biomass pretreatment methods before the liquefaction process have been studied to promote the yield of bio-oil. Liu et al. (2011) studied the liquefaction of cornstalk with acid-chlorite pretreatment. The acid-chlorite delignification method was used in the cornstalk pretreatment procedure to enhance the conversion of cornstalk into hot-compressed water/ethanol liquefaction. It was found that the pretreatment was effective for promoting the bio-oil yield and decreasing the optimum reaction temperature and time elapsed. The pretreatment of cornstalk can also affect the main chemical components of the raw material and the liquefaction process. Liu et al. (2014) also investigated the feasibility and reaction mechanism of hydrothermal liquefaction of cypress via alkaline pretreatment to elevate the yield of bio-oil. It was found that alkaline pretreatment could enhance the bio-oil yield; it proved helpful for suppressing the re-polymerization reactions and enhancing the decomposition temperature of cellulose. Shi et al. (2013) studied the feasibility of the thermo-chemical conversion of rice husk in hot-compressed water via ultrasonic pretreatment. This study found that ultrasonic pretreatment affected the physicochemical properties of rice husks and significantly increased the yield and altered the chemical composition of bio-oil. The other prevailing pretreatment methods include alkali pretreatment (Xiao et al. 2014), acid pretreatment (Imman et al. 2014), ozonolysis pretreatment (Travaini et al. 2013), organosolv pretreatment (Gandolfi et al. 2014), and ionic liquid pretreatment (Socha et al. 2014). The solvent pretreatment method seems to be the most promising because of the lower energy consumption required in the liquefaction system. Because of the complexity of biomass liquefaction production, the properties of bio-oil have been investigated by lump analysis (Liu et al. 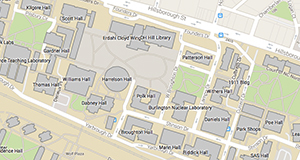 2103). The generated bio-oil was distinguished into water-soluble organic compounds and dead oil based on differing characteristics. The results showed that the lump analysis method was valid for research on bio-oil. In our previous work (Zhang et al. 2014), the bio-oil was separated into three fractions by lump analysis: water-soluble, ether-soluble, and ether-insoluble. Many researchers have carried out biomass liquefaction under various acidic and alkali pretreatment conditions, but there is little literature comparing the two pretreatment methods. To further investigate the pretreatment process, sulfuric acid (H2SO4) and alkali (NaOH) delignifications were used for pine wood pretreatment first. Then, the liquefaction of pretreated samples was performed in a stainless steel reactor with methanol as a solvent. Furthermore, the bio-oil was analyzed using the lump analysis method. The influences of the temperature, methanol content, and residence time on the yield of the water-soluble fraction (WS), ether-soluble fraction (ES), and bio-oil were also determined. The purpose of this study was to compare the efficiency of the acid and alkali biomass pretreatment methods before liquefaction. where C, H, and O in the formula represent the mass percentage of carbon, hydrogen, and oxygen, respectively. The elemental analysis showed that the pine wood sample used in this study contained 47.18% carbon, 6.96% hydrogen, 43.60% oxygen, 0.83% nitrogen, and 1.43% sulfur (on a dry basis). The HHV of the sample was 18.13MJ/kg. The solvents used in this study were of analytical grade sulfuric acid (98%), sodium hydroxide, and methanol. They were purchased from Aladdin Industrial Corporation, Shanghai, China. The pretreatment of pine wood (10 g) was conducted in a triangle flask using either 5% sodium hydroxide solution or sulfuric acid with the same concentration. The triangle flasks with pine wood samples and solvents were then sealed and placed in an oil bath at 50 °C for 1.5 h. Then, the samples were removed from the bath, and a vacuum extraction filtering method was used to filter the samples until the pH of the filtrate was neutral. Finally, the samples were dried at 105 °C for 24 h and kept in desiccators at room temperature before use. Liquefaction process was carried out in a 0.5-L stainless steel autoclave with magnetically driven stirring (GSH 0.5A/20, Huixinghuagong, Weihai, Shandong, China). In a typical operation, 10 g of pine wood and 100 mL of methanol were fed into the autoclave. Before the reaction, nitrogen was purged into the reactor five times to remove oxygen or air; then, the reactor was heated to 350 °C at a heating rate of 10 °C/min and maintained constant for 10 min as residence time. After the reaction was completed, the reactor was immediately cooled to room temperature using cool water. The liquefaction product separation procedure is shown in Fig.1. After the reaction was completed, the gaseous product was collected without further analysis. The liquid and solid products were then washed with de-ionized water four times before being separated by vacuum filtration. The filtrate was separated into two sets of products after rotary evaporation under reduced pressure at 55 °C. The product of the aqueous phase was called water-soluble oil. The solid phase product was extracted with ether, and the extraction procedure was continued until the solvent in the beaker became colorless. After removing ether in a rotary evaporator with reduced pressure, the ether-soluble oil was then collected with water-soluble oil, and the ether-insoluble fraction was dried in an oven at 105 °C for 4 h to obtain a solid residue. The chemical compositions of raw and pretreated pine wood were measured. Cellulose, hemicelluloses, and lignin contents were determined by a Laboratory Analytical Procedure (LAP) of National Renewable Energy Laboratory (NREL) (Sluiter et al. 2008). The surface morphologies of the raw and pretreated samples were observed using an SEM, Hitachi 3400-I (Hitachi Ltd., Japan). The samples were evenly sputtered with a thick layer of gold spread from all sides at two different angles using Ion Sputter, E-1010 (Hitachi Ltd., Japan). in which I002 is the peak intensity of the crystalline portion, at 2θ=22.5°, and Iam is the peak for the amorphous portion of biomass, given as 2θ=18.7°(Ahmadi et al. 2013) in most of the literature. A gas chromatograph-mass spectrometer (GC-MS) was employed to indicate the distribution of liquefaction products. GC-MS analyses were conducted on a model Agilent 7890N/5975N (Agilent, USA) using an HP-5MS capillary column (30 m×0.25 mm×0.25 μm) via a helium sweeper gas stream. The column temperature of the GC used in this paper was programmed from 45 to 250 °C with a 5 °C/min heating rate. The injector temperature of the GC-MS was kept at 250 °C. A split ratio of 1:80 was used. The mass spectra were acquired in electron ionization mode at 70 eV, and scans per second ranging from 35 to 550 amu (m/z). The optimum temperature for biomass liquefaction has an important relationship with the contents of cellulose, hemicellulose, and lignin in the biomass feed stock; therefore, the content of raw material is a crucial factor influencing the yield of bio-oil during the thermo-chemical conversion of biomass. The pretreatment technology using certain solvents could change the physico-chemical structure of biomass to some extent and improve the yield of bio-oil while decreasing the required reaction temperature. 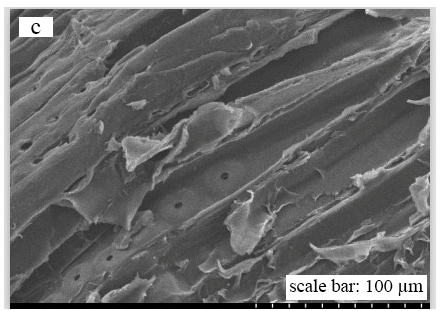 In this research, pretreated and untreated pine wood was employed to explore the changes in the contents of cellulose, hemicellulose, and lignin. As can be clearly seen in Fig. 2, the pretreated and untreated samples had varying amounts of the three components. The contents of cellulose, hemicellulose, and lignin were 42.9%, 26.7%, and 26.4%, respectively, in the raw sample. The relative contents of cellulose were increased by pretreatment as compared with untreated pine wood. 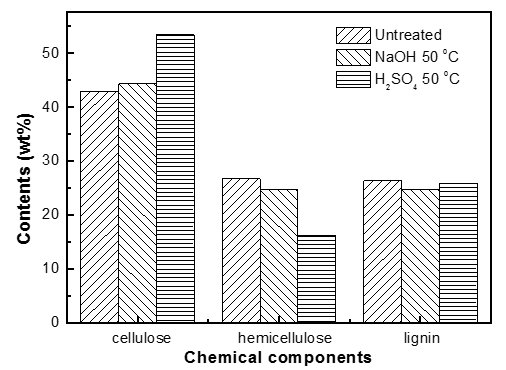 The content of hemicelluloses decreased from 26.7% (untreated) to 24.7% (NaOH), and 16.1% (H2SO4), while the content of lignin decreased from 26.4% (untreated) to 25.9% (NaOH) and 26.1% (H2SO4). The results indicated that the two pretreatment methods did not markedly remove lignin, but partly removed hemicelluloses, and the effect of H2SO4 was more obvious. 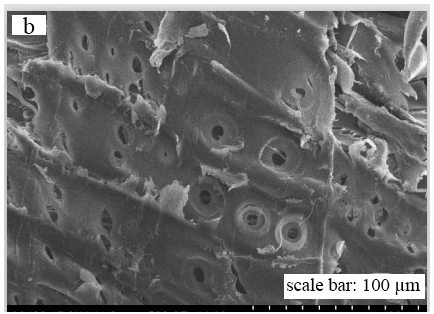 The morphological changes in the pine wood after pretreatment were determined by scanning electron microscopy (SEM). The SEM images of the raw and pretreated samples are shown in Fig. 3. The sample surface was tight, smooth, and it contained a negligible quantity of holes before pretreatment. However, after pretreatment, when the structure of the samples was destroyed, many holes were observed, and the number of holes on the surface of the sample pretreated by NaOH increased (shown in Fig. 3). After the treatment by H2SO4, the sample became relatively fluffy and the fibers were exposed and separated from the initial connected structure. The size of holes generated was smaller than that with pretreatment by NaOH. Generally speaking, the appearance of holes, fragmenting, and wrinkles on the surface after pretreatment resulted in the enhancement of the accessibility of the sample to methanol and increased the reaction rate in the biomass liquefaction process. Many pretreatment methods can disrupt the hydrogen bond in cellulose fibrils, changing the crystalline structure of cellulose. The crystallinity of a fiber refers to the percentage of the cellulose crystalline region with respect to total cellulose, and the tensile strength and elastic modulus of fibers increase with increasing crystallinity. It is difficult to measure the true crystallinity of biomass because biomass contains hemicelluloses, lignin, and non-crystalline cellulose, in addition to crystalline cellulose. However, the best option to estimate the effect of pretreatment on the crystallinity index of biomass is still X-ray measurements; biomass degradation is more easily detected with lower crystallinity than with higher crystallinity. The features of pine wood after pretreatment were determined by powder X-ray diffraction (XRD) and were compared with the untreated sample. The crystallinity index (CrI) calculated from the XRD data is shown in Fig. 4. The raw sample had a low CrI (40.4), while the value jumped to 41.2 and 45.4, respectively after pretreatment with NaOH and H2SO4. The increase was modest. On the one hand, the small increment after pretreatment indicated the destruction of non-crystalline cellulose. On the other hand, the small effect suggested that the pretreatments were not able to thoroughly break apart the hydrogen bonds in cellulose fibrils. 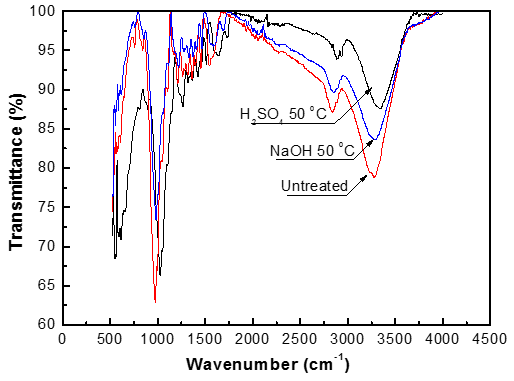 An FTIR spectrophotometer was used to investigate the changes in functional groups of the samples before and after pretreatment, as shown in Fig. 5. The IR spectra of untreated and pretreated pine wood exhibited absorption peaks in the region of 650 to 4000 cm-1, which appear to be influenced by the pretreatment process. The decreasing trend in the peak at 1061cm-1 (stretching of C-O-C) demonstrates that the functional group was fragmented and the structure of fiber was destroyed after pretreatment. The absorbance at 1732 cm-1 represents the stretching vibration of C=O on –COOH group. The decreasing trend here suggests a decrease in the hemicelluloses and lignin contents after pretreatment, in agreement with previous analysis. The absorbance at 3434 cm-1 represents the stretching vibration of –OH; the decreasing intensity here indicates that the hydrogen bonds in cellulose fibrils were broken down by the pretreatment methods. 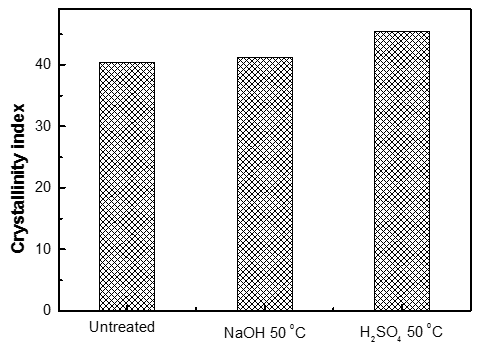 In this study, H2SO4 and NaOH were introduced to pretreat pine wood to improve the yield of bio-oil. The separation of three main components resulted from pretreatment made good contribution to the upcoming liquefaction process. The effects of reaction temperature, residence time, and methanol amount were investigated during the liquefaction of untreated and pretreated pine wood with methanol. Temperature is an important parameter affecting the biomass liquefaction process. Normally, lower temperature and pressure lead to lower bio-oil yield (higher char yield). Therefore, higher temperature and pressure favor thermal liquefaction. To investigate the effect of various pretreatments on the yield of bio-oil generated from the liquefaction of pine wood before and after pretreatment, the experiments were conducted under the same conditions: 10 g of pine wood (untreated and pretreated) in 120 mL of methanol with zero minute residence time. The yields of the WS, ES, and bio-oil obtained from the liquefaction of the three samples at various temperatures are shown in Fig. 6. The liquid products composed of WS and ES were the targeted products in the liquefaction process of pine wood. It can be seen in Fig. 6 that the pretreatment could potentially improve the conversion efficiency of biomass liquefaction and increase the yield of bio-oil in the temperatures range of 200 to 350 °C. The maximum yield of bio-oil from the liquefaction of untreated biomass was 20.3%, at 290 °C, while the pretreated samples obtained a higher bio-oil yield. For example, after being pretreated by NaOH, the maximum yield of bio-oil reached 35.6% at 290 °C. These results suggest that the pretreatment enhanced the accessibility of methanol and the susceptibility of pine wood. For both the untreated and pretreated samples, the bio-oil had the highest yield at 290 °C; with increasing temperature, the yields of all the bio-oils decreased, which can be ascribed to the conversion of bio-oil to gas or residues by the secondary and tertiary reactions of fragmentation, dehydration, and isomerization at higher temperatures in the presence of methanol. Therefore, this modest temperature was most beneficial for the yield of bio-oil. The yield of bio-oil was composed of WS and ES. The composition of WS and ES will be discussed later. As can be seen in Fig. 6, the impact of temperature on the yield of WS and ES can be separated into two parts. Initially, the rising temperature accelerated the degeneration of biomass; after reaching the maximum yield, increasing the temperature further inhibited the liquefaction process, which led to a decrease in the yields of WS and ES. The maximum WS yields from the liquefaction of pine wood pretreated by H2SO4 and NaOH were 25.5% (290 °C) and 28.5% (260 °C), respectively. 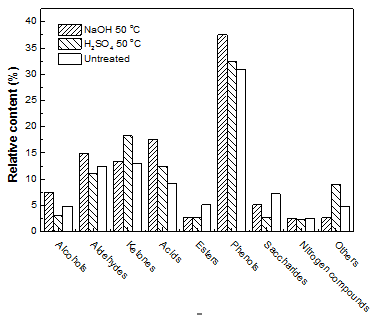 Comparatively, the maximum ES yields from the liquefaction of pine wood pretreated by H2SO4 and NaOH were 15.6% (320 °C) and17.1% (290 °C), respectively. Therefore, a conclusion can be drawn that the pretreatment improved the yield of WS, ES, and bio-oil compared with the untreated material. Residence time is another vital parameter that affects the yield of bio-oil during the liquefaction process. Higher residence time results in secondary and tertiary reactions of bio-oils. These reactions could potentially convert bio-oil into gas and residues, resulting in a decrease in the yield of bio-oil. Figure 7 illustrates the influence of residence time on WS, ES, and bio-oil yields during the liquefaction of untreated and pretreated pine wood (10 g in 100 mL methanol) at 290 °C. Generally speaking, the yields of WS, ES, and bio-oil obtained from the liquefaction process decreased with increasing residence time from 0 to 25 min. The effects of residence time may be attributed to the decomposition and repolymerization reactions of WS, ES, and bio-oil with increasing residence time. However, for the untreated pine wood, the yield of WS initially increased with residence time and then decreased with a further increase in time. The maximum yield of WS was 20.3%, which was obtained when the residence time was 0 min; similarly, the maximum yields of bio-oil (36.1%) and ES (15.8%) were obtained here. Obviously, a shorter residence time could keep the bio-oils from repolymerizing, to obtain a higher yield of bio-oil. Furthermore, a shorter residence time requires less heat input, making the process more energy-efficient. Biomass cannot be degraded efficiently without pretreatment. The purpose of pretreatment is to break down the bonds such as those of hydrogen and ether, and to accelerate the interpenetration of solvent in the liquefaction process. The effect of methanol amount on the yields of WS, ES, and bio-oil during the liquefaction of pine wood (10 g pine wood, 290 °C and zero minute residence time) are shown in Fig. 8. It is clear that the methanol amount had a positive effect on the yields of WS, ES, and bio-oil: the yields all improved with increasing methanol amount from 20 to 120 mL. During the liquefaction process, the effect of solvent is to dissolve the pine wood and supply free radicals, which can stabilize liquefaction intermediates and stop them from forming secondary compounds. Thus, the presence of a solvent can improve the yield of bio-oil. Figure 8 also demonstrates that the pretreatment had a synergetic influence on the yields of WS, ES, and bio-oil when compared with the liquefaction of untreated samples. A GC-MS apparatus was used to identify the chemical composition of bio-oil produced by liquefaction of untreated and pretreated pine wood. The liquefaction process parameters were as follows: 290 °C, 10 g of pine wood, 120 mL of methanol, and zero minute residence time. It is clear that the liquid production from the liquefaction process was complex, as there was no standard mixture to calibrate the MS detector. Therefore, the relative content of each compound was unable to represent the actual concentration. The relative contents of groups of chemicals are shown in Fig. 9. As shown in the figure, phenols, ketones, acids, and aldehydes are the main components in bio-oil. After pretreatment, the contents of most of the chemicals increased, and the effect of NaOH was shown to be better than that with H2SO4. Because of the complexity of the composition of bio-oil, it was very difficult to identify the reaction pathways for this group of compounds. Composition analysis and scanning electron microscopy observation were performed to demonstrate that H2SO4 and NaOH pretreatment altered the main composition and physical features of pinewood. The changes in the structure and physicochemical properties make liquefaction easier and effectively enhance the bio-oil yield. The influences of the temperature, methanol amount, and residence time on the yields of the water-soluble fraction (WS), ether-soluble fraction (ES), and bio-oil were determined. A modest temperature was favorable for higher yields of bio-oil, while shorter residence time and higher amounts of methanol favored the products of WS, ES, and bio-oil. The GC-MS analysis showed that phenols, ketones, acids, and aldehydes are the main components in bio-oil. After pretreatment, the contents of most of the chemicals increased, and the effect of NaOH was shown to be better than that with H2SO4. The authors acknowledge financial support from the Six Talent Peaks project in Jiangsu Province (Grant No. 2015-XNY-006), Natural Science Foundation of Jiangsu Province, China (Grant No. BK20141451). Sluiter, A., Hames, B., Ruiz, R., Scarlata, C., Sluiter, J., Templeton, D., and Crocker, D. (2008). Determination of Structural Carbohydrates and Lignin in Biomass, (NREL/TP-510-42618), National Renewable Energy Laboratory, Golden, CO. Article submitted: April 21, 2016; Peer review completed: June 26, 2016; Revised version received: April 2, 2017; Accepted: April 3, 2017; Published: April 7, 2017.